Conservative site Rare.us is shutting down at the end of this month. “As some of you have already heard, Cox Media Group, our parent company, will be discontinuing Rare at the end of this month,” Rare’s politics editor Jack Hunter wrote on Facebook. According to Axios, which first reported the news, the demise of Rare.us is another example of a viral site built on Facebook’s traffic that could not survive the platform’s algorithm change to its News Feed, now prioritizing posts from friends and family over publisher content. Last week,LittleThings — a site dedicated to uplifting and empowering content for women — announced it was shutting down, following a deadly decline in Facebook traffic after the platform’s algorithm change. According to LittleThings’ CEO Joe Speiser, the site experienced a 75% drop in traffic. Rare has about 3 million Facebook fans. The site's traffic peaked in 2014 at around 22.5 million global unique visitors, according to Axios, citing Quantcast data, but traffic fell to 5.5 million global unique visitors in February 2018. 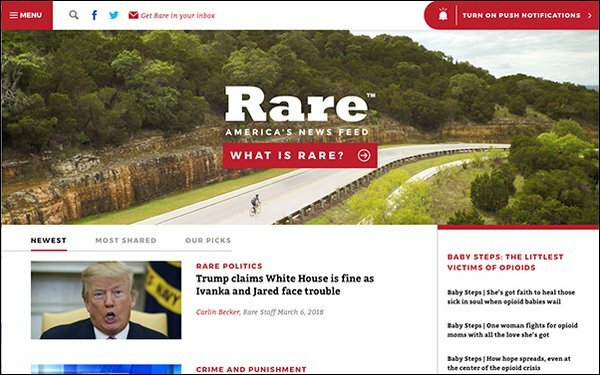 Rare.us published a mix of aggregated and original content for conservatives, ranging from news, politics, entertainment and lifestyle topics.